Coming into December, I was hard-pressed to think of how AMD could improve Radeon Software after years of rock-solid annual feature updates. But somehow, they’ve done it. 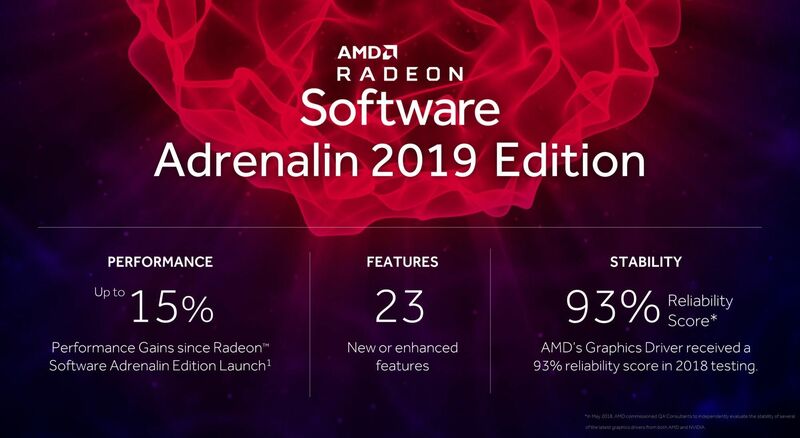 On Thursday, the company announced Radeon Software Adrenalin 2019 Edition, a sweeping upgrade that builds on past successes introduced in Catalyst Omega, Crimson, ReLive, ReLive 17.7.2, and last year’s own Adrenalin. Radeon Software Adrenalin 2019 Edition includes a delicious bounty of features intended for newbies and gaming enthusiasts alike, from performance suggestions to automatic Wattman overclocking—and an intriguing new game-streaming technology built to challenge Valve’s Steam Link. Better yet, AMD directly addressed some of the most pressing requests voted on by Radeon users. These days, Radeon Software is giving Nvidia’s GeForce Experience a serious run for its money. Let’s dig in. Radeon Software holds all sorts of useful settings and tweaks, but they can be a bear for entry-level gamers to discover, hidden deep inside layered menus full of arcane technological terms. 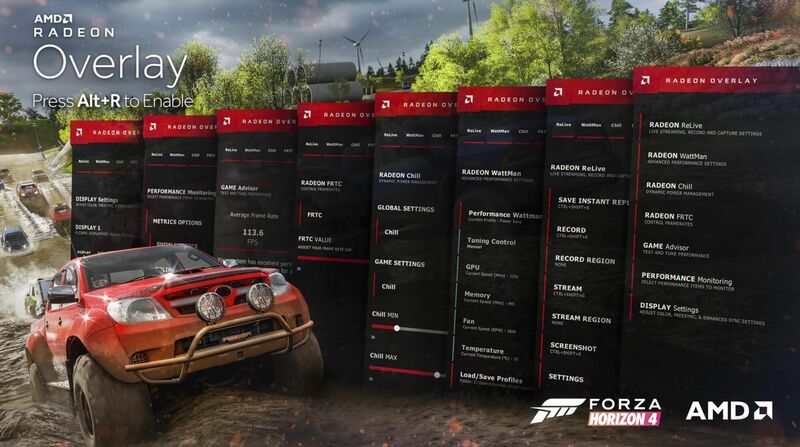 A trio of fresh “Radeon Advisors” tools aim to surface the most critical options for users. First up: Radeon Settings Advisor. This new tool in the Settings menu will scan your system and give you a list of recommendations that ensure your PC is gaming as smoothly as possible. 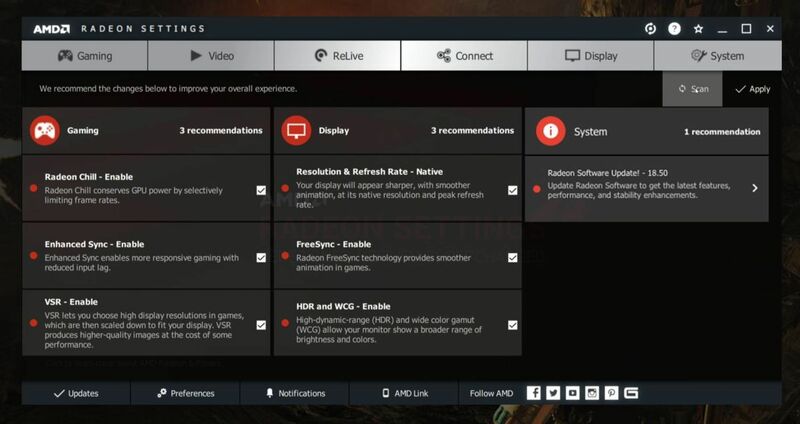 Depending on your system and display configuration, the Settings Advisor might suggest actions like enabling FreeSync or HDR visuals, adjusting your monitor’s resolution or refresh rate, updating to the latest available drivers, or activating AMD-specific features like Enhanced Sync, Radeon Chill, or Virtual Super Resolution. That’s handy information indeed for new users. But at its core, Settings Advisor surfaces settings that have long been available, yet lurking deep in sub-menus. How will entry-level gamers know the new tool even exists? When I posed that question, AMD’s Scott Wasson confirmed that a Radeon Settings Advisor prompt will pop up as a toast notification in Windows 10. I’m normally against applications that push superfluous notifications, but Settings Advisor is anything but superfluous, and I’m thrilled to see AMD working to make gaming more welcoming for novices. Once you’ve got all the basic settings squared away, Radeon Game Advisor helps you make sure your games run their best. If your game isn’t playing quite as well as expected, you can open the Radeon Overlay and run the new tool. It’ll run in the background, observe performance, then spit out a list of suggestions at the end. If your frame rate and frame time aren’t up to snuff, for example, it might recommend reducing the render scale, dropping to a lower graphics quality level, or stepping down the resolution. Like Settings Advisor, Game Advisor sounds especially helpful for beginners. And it could prove more accurate than Nvidia’s notoriously, uh, temperamental game optimization feature. Nvidia’s optimization recommendations are generated solely by the hardware inside your gaming rig, while Radeon Game Advisor actively measures your system’s performance while you’re playing games. I’m looking forward to digging into the tool more over the coming weeks. Finally, there’s Upgrade Advisor, a polished-up version of an existing feature. 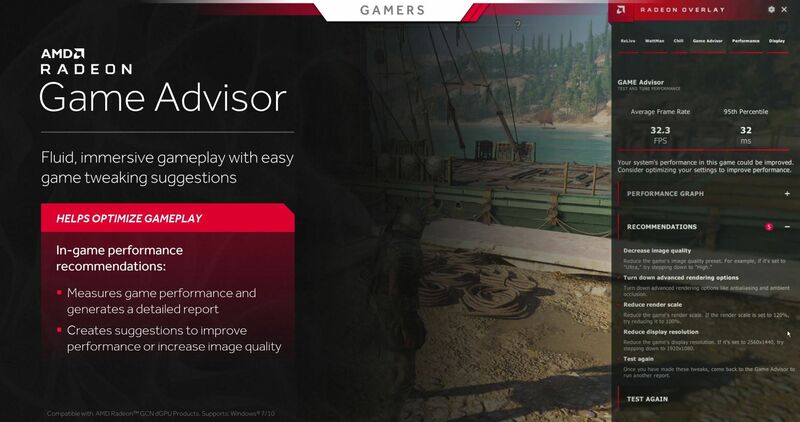 Upgrade Advisor scans the hardware in your PC, compares it against the developer-recommended hardware for the games on your drive, and lets you know if you might want to upgrade your CPU or GPU. If so, it’ll link directly to relevant e-tailer pages for AMD products. The new interface for this tool shows relevant information much more quickly and clearly than previous iterations did. Wattman, the nifty overclocking software found right inside Radeon Settings, is getting upgrades that both give you more control over how your graphics card behaves, and take some of the headache out of squeezing better performance out of it. Some enthusiasts enjoy the process of overclocking, but turning dials and testing settings for optimal performance can take a very long time. Radeon Software Adrenalin 2019 Edition adds several options to automate the finicky process. Now, Wattman includes three different buttons to auto-overclock your Radeon GPU’s clock speed, auto-overclock your GPU’s memory, and—get this—auto-undervolt your graphics card. AMD representatives admitted that the auto-overclocks won’t get quite as aggressive as you could get if you manually overclocked your graphics card (and had a high tolerance for risk), but they should provide an easy boost in performance with minimal hassle. Tinkerers could treat the auto-adjusted settings as a starting point for further manual tweaking. The undervolting capabilities bring an enthusiast-level trick to the masses. 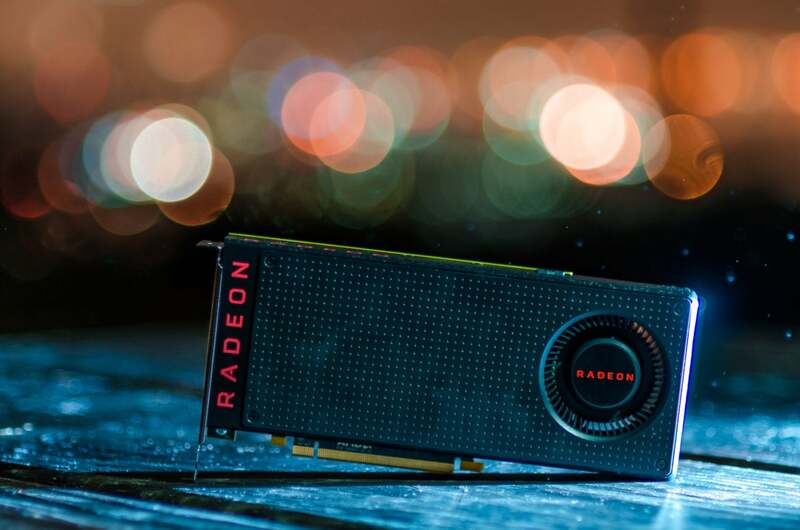 Recent Radeon graphics cards sometimes push past their optimal power curve to achieve higher performance and compete with Nvidia’s GeForce rivals. Savvy Radeon owners, especially ones who own Vega cards, can attempt to undervolt their GPUs to reduce power consumption and heat levels without sacrificing performance. Now Wattman can do it for you. Yes please! 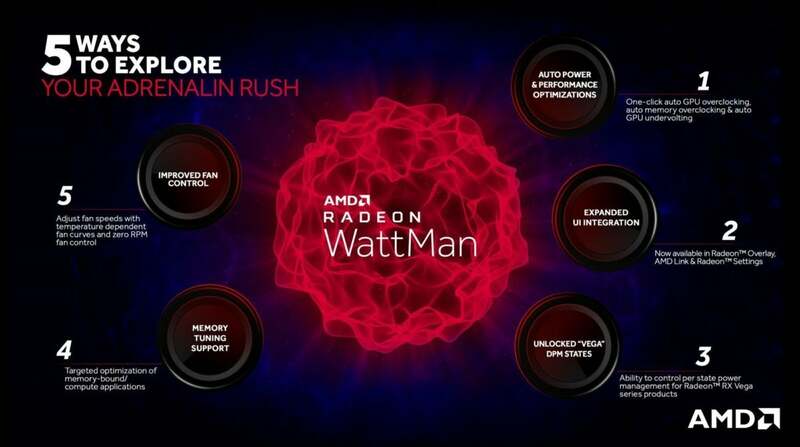 Radeon Software Adrenalin 2019 Edition also unlocks previously restricted tools in Wattman. Enthusiasts can now tinker with advanced features like fan curve controls, zero RPM fan functionality, Vega’s power management states, and even memory stepping options if they want to try to optimize performance in non-gaming applications like blockchain tools. Another nice touch: Now you can access Wattman controls in-game via either the Radeon Overlay or using the AMD Link mobile app. Yes, that means you can overclock your Radeon graphics card from your phone while your PC is actively gaming. The future is as glorious as the technologists promised, friends. 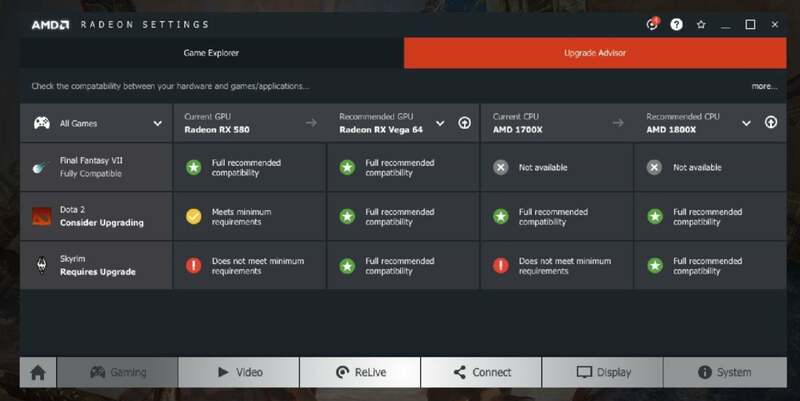 AMD’s ReLive game-streaming and video capture tools get a lot of love in Radeon Software Adrenalin 2019 Edition. The tools now let you instantly activate a picture-in-picture replay of your most exciting gaming highlights, capture multi-channel audio, customize streaming video aspect ratio with more options, save instant GIFs, and even customize your stream overlay without the need for third-party software like OBS thanks to the inclusion of a basic scene editor. But the standout feature challenges Valve’s Steam Link app. And as a Steam in-home streaming fanatic, I’m very excited about the prospect. The company claims it can deliver up to 4K/60-fps experiences on mobile devices and 1440x1440 resolution on VR headsets at low latency, all thanks to low-level hardware acceleration and the fact that AMD controls the entire technology stack on the PC encoding side. AMD claims it can stream with up to 44 percent higher responsiveness than “competitive solutions” like the Steam Link app. The VR and mobile solutions both support wireless controllers. You can also use on-screen controls if you’re streaming to a phone or tablet. The mobile solution also allows you to stream your Windows desktop and non-gaming applications, which is just brimming with possibilities. Radeon’s Scott Wasson explained how AMD achieved the results. It all starts with ReLive’s streaming software stack: AMD’s frame capture engine is used to record and stream your games to other devices, and the graphics driver gets direct access to the frame buffer as soon as your game renders an image. The final step of the process relies on the dedicated asynchronous compute hardware built into Radeon GPUs to capture gameplay on your PC with minimal overhead. “Video streams are encoded in H.264 with Radeon video encoding hardware,” Wasson told me via email, and optimized for a blend of low latency and good visuals. The networking aspect of the process builds upon optimizations originally devised for wireless VR capabilities. Every aspect of the process is tuned for solid performance. Wireless VR streaming uses the VR capabilities of the local headset to minimize perceived latency. It’s very intriguing technology, and if that claim of 44 percent faster responsiveness proves anything close to accurate, I can’t wait to give it a whirl on my iPhone XR. 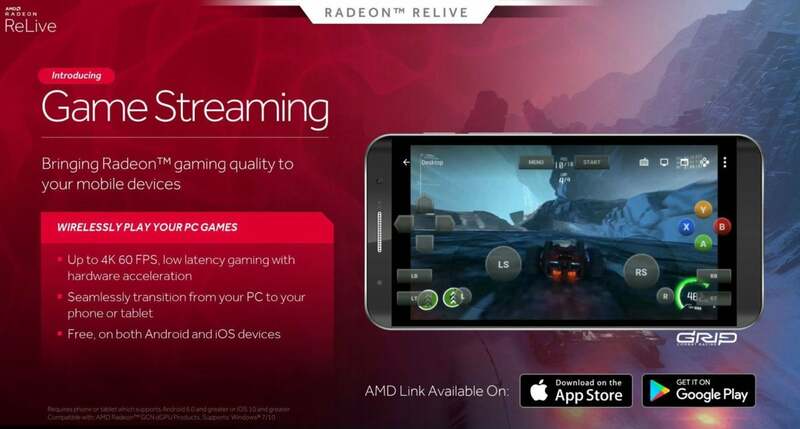 You’ll be able to stream games to your mobile device via the AMD Link app after it’s paired with a gaming PC over a local network, while AMD plans on releasing VR apps for various platforms to bring game-streaming to those. 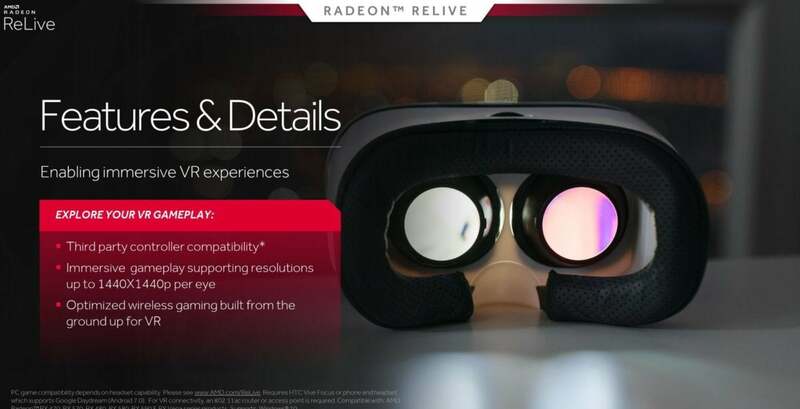 Radeon Software Adrenalin 2019 Edition includes a legion of improvements beyond those flagship features. Radeon Chill now saves up to 20 percent more power in select titles, such as Fortnite, Overwatch, and PlayerUnknown’s Battlegrounds. 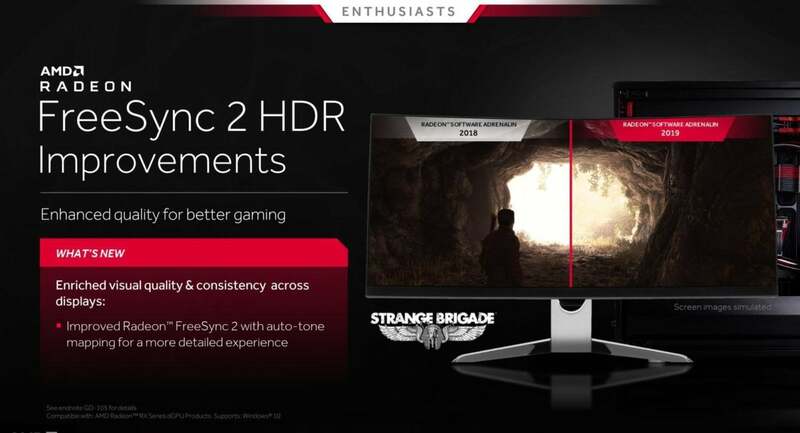 FreeSync 2 displays now perform auto-tone mapping to avoid a blown-out effect in some HDR scenes. Virtual Super Resolution support now extends to 21:9 ultra-wide monitors. The Radeon Overlay now lets you adjust display options such as Enhanced Sync, FreeSync, and per-game color controls. It provides more fine-grained performance metrics than before, including frame time metrics. You can also adjust the positioning and look of the performance overlay. Finally. The AMD Link mobile app supports voice inputs that let you control basic ReLive options or ask for current performance metrics hands-free. You can now manage your ReLive gallery in-app as well. Radeon’s software team has been on a tear in recent years, improving reliability and shipping day-one game drivers at a furious pace. After several years of solid annual feature updates, I wasn’t sure how AMD could improve Radeon Settings any more—but Radeon Software Adrenalin 2019 Edition delivers in spades. Beginners and veterans alike will find worthwhile goodies lurking inside this release. With Radeon Software Adrenalin 2019 Edition, any lingering concerns about AMD drivers should be dead and buried—but that’s not all. This superb feature update puts Radeon Settings in strong contention to be the best graphics card software suite around. Consider yourself on notice, Nvidia.